I was honoured to be invited along to the Sheffield Royal Society for the Blind as part of the Off The Shelf Festival recently and since it was my first ever trip to Sheffield, I didn’t quite know what to expect. I was met at the station by Julie Smith who gave me a whistle stop tour of the city – I can see now why it’s described as one of, if not the greenest city in England. I love Tudor history so I was particularly interested to see Sheffield Manor Lodge where Mary Queen of Scots was imprisoned. After the tour we then set off for Sheffield Royal Society for the Blind to join the Mappin Writers Group who shared some of their beautiful, funny, touching, emotive, thought-provoking and incredible writing and poetry. It was a very special event at SRSB and I felt privileged to be able to talk about my third book Where I Found You and my heroine Maggie who is a visually impaired mum-to-be. I explained how challenging it was for me as an author to describe Maggie’s world in a non-visual way, but then I had to have words with myself… What kind of challenge was that compared to living without sight?! I can only hope that my novel came somewhere close to doing justice to those real-life mum’s, some of whom I met, who haven’t let their disability hold them back. All in all, I’m so glad I got to meet a remarkable group of people and to listen to their experiences coming through in their own writing. Thank you to Sue Coggin for inviting me, to my fellow writers who made me feel so welcome and a special thanks to Julie Smith for the amazing poem she gave me. 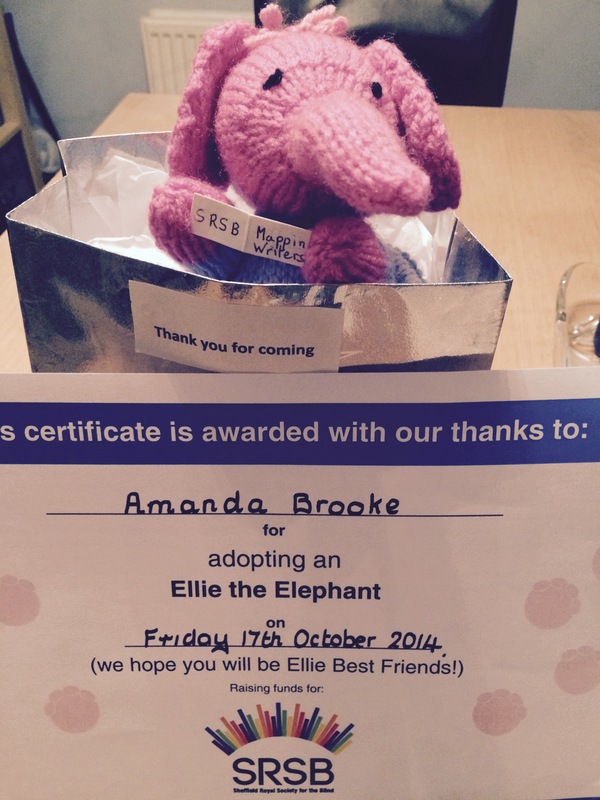 I would also like to thank SRSB for the flowers and the elephant – which I have now adopted and have a certificate to prove it. I think I’ve made some lovely friends in Sheffield and will have to go back there soon. Thanks Sarah, would love to visit Birmingham and I’m hoping to do more events so watch this space!